Today I received an email from Fredrik Holmqvist (TQH, of Bezilla fame) about a video that he recently created and posted on Vimeo. 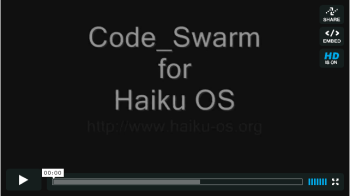 Titled “Code_Swarm for Haiku,” this is a video generated using Code_Swarm, a technology that allow visualizing the activity on a software repository. The video that TQH created was generated from the Haiku subversion commit messages, and shows the period starting from the time Haiku moved to Subversion up until revision 26538. Check it out here; it’s recommended that you watch the HD version in fullscreen. For those who don’t have or want to use Flash, you should also be able to download the source video (1280x720) from Vimeo (account required). Pretty neat Fredrik. Thanks for sharing this!